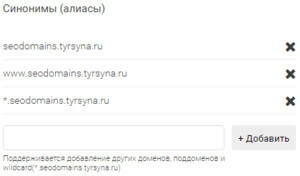 SEO Domains — This is the addition of additional domains and subdomains for the site, with the ability to import domains from the XLSX file, and automatically add them to the Yandex Webmaster. To add additional fields to the selected domain, click Additional fields and click add, enter the key which will be available through a call to the placeholder (Example: [[!+sd.price_1]]), as well as other fields. Call the SeoDomainsList snippet at the desired location. Q: Where can I find an example xlsx file to import?